The T214 Victory set is another one that gets confused with the much more famous T206 set due to a similar design and even the same photos. However, they're an awful lot harder to find and therefore several times more valuable. In fact, they're so tough some collectors aren't convinced all the cards have been found yet. 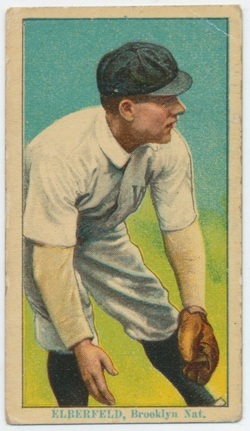 Like many card sets that appeared in the early 1900s, the set features a lithograph of a player with a white border. Below the photo are a last name and a team city and league if necessary. Unlike T206 cards, the ink used for the text is blue. 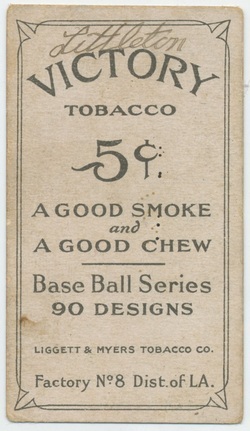 On the back is an advertisement for Victory tobacco, with a notation that there are 90 total cards in the set. That number has not yet been confirmed, as there are currently 61 known cards in the set. In 1990, the number of known cards was 30. There is still the possibility that more cards can be discovered. Like many of the tougher T-series card sets, these cards were distributed around the New Orleans area. Set Description: Victory Tobacco issued this set in the Louisiana area in 1915. The fronts use the same images as the T206 set with the Blue lettering as the T213 set. The backs are easy to recognize for the Victory name across the top.